Hearing aids have come a long way in recent years due to rapidly advancing digital technology. Modern hearing aids come in a wide range of sizes and styles that offer Littleton patients several exciting and innovative features. Choosing the perfect hearing aids for your needs requires professional hearing loss treatment advice and guidance. Your lifestyle needs and activity level. Helping patients find hearing aids that work with their lifestyle is a top concern. Your hearing loss provider will explain the different levels of activity hearing aids are designed for and help you determine which category your regular routine falls into. Then, you can choose hearing aids based on your lifestyle and activity level needs. The type, frequency and severity of your hearing loss should all weigh into which hearing devices you choose. Your Littleton hearing care professional will explain these facets of your hearing loss to you and help you understand which devices are the best bet to offer unbeatable treatment for your hearing loss. The variety of sizes and styles of hearing aids available leads to a lot of differences in the features and functions each device offers. Smaller devices often have fewer features but more natural functionality, while many larger devices have more built-in features. Make sure you fully understand the features offered by each device and work with your audiologist to choose the hearing aid with an ideal array of functions for your needs. 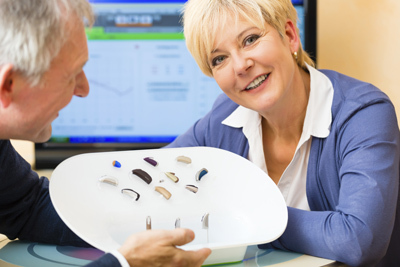 Today’s hearing aid accessories are very technologically advanced and offer Bluetooth connectivity, audio looping technology and much more. Rather than controlling devices as you wear them, many digital hearing aids offer automatic programming and remote control adjustments using accessories or smartphone apps. As you choose your new hearing aids, take time to consider which accessories and remote control options you will use most. It’s important to feel comfortable and confident wearing your hearing aids day in, day out, so you shouldn’t discount these concerns. Your audiologist will work with you to find a pair of hearing devices that you find comfortable enough to wear during your daily routine and confident enough to wear during any task or activity. Hearing aids range widely in cost. At Columbine Hearing Care, we do all of our hearing aid billing in house and are committed to helping our patients get the right pair of hearing aids without putting a huge strain on your budget. Talk to your audiologist about payment options during your next appointment.